The bar of choice for many college-age people. Offers indoor dancing upstairs with a DJ, inside and outside bars, and live music with an additional bar on the lower level. A fun place to hang out and meet people from all over. 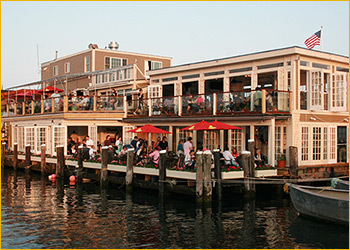 This popular nightlife destination features live music outdoors every afternoon and evening. Intimate club with small candle-lit tables and couches, a large bar and a dance floor with a D.J. The crowd is varied, but definitely expect an eclectic mix of people of all styles and ages. Dress code.